BUY THIS APPLE POWERBOOK G4 12″ LAPPIE AND HELP US MOVE!! Obviously selling this lovely little lappie to finance our move to Londres (goodness me how time flies!). We’re actually upping roots in 3 weeks! EEEK. and STILL we need the dollar to move… so please bid generously! CLICK HERE TO VIEW THE eBAY LISTING! The laptop has a few minor scratches on the exterior metal due to unavoidable wear. The only other small problem is that the processor fan is quite loud, although I have replaced it with a new fan, which reduced the noise somewhat, this does not effect the performance of the computer at all. Any questions? send me an email! We need money for moving to London! So look at this! CLICK HERE TO VIEW THE eBAY LISTING NOW! James literally bought this XBOX 360 Arcade console for the latest and greatest Grand Theft Auto release. He also bought Grand Theft Auto seperately. He’s selling both together as a neat package on eBay. He has completed GTA and subsequently has no need for this XBOX now (we’re not console players, apart from the Wii, but that doesn’t count!) So yeah, its ACTUALLY brand new!! So please please PLEASE help us in our funding for our big bad move to the big bad smoke! 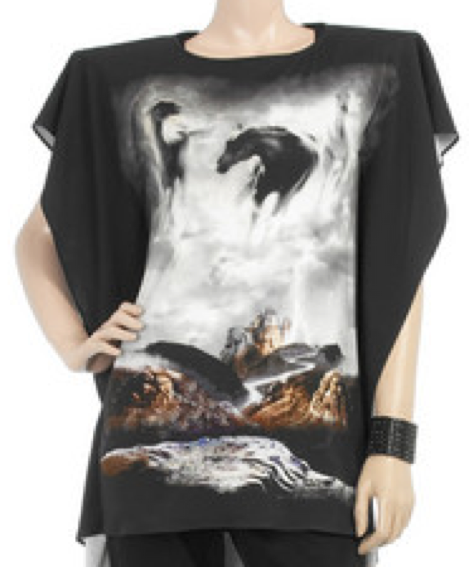 FRIDAYS MUST HAVE: ‘Fantasy Horse’ T-Shirt by BOUTIQUE (@ Topshop). This t-shirt is amazing, and I’m mostly certainly going to be on the purchase when I visit London in 19 days time! Its so 80s its untrue. I think it’ll look fantastic teamed with super skinny black jeans and seriously killer patent heels, OR, if in my case your no taller than 5 ft, I could get away with wearing it with tights as a dress I reckons. IN ADDITION, to top it off, see the below dress, taken from http://www.net-a-porter.com where either Topshop have taken their inspiration (which I presume they have), or has MAISON MARTIN MARGIELA twoc’d the design from Topshop?? OTHER TITLES: FRIDAYS MUST HAVE! Romantic Frill Dress from TOPSHOP. Miss S Chain Detail Bag.